These homemade Chinese vegetable dumplings take 15-20 minutes to prepare. This recipe makes 7-8 dumplings that are pan fried and steamed. These dumplings also can be made using 1 wrapper and decreasing the oil and chicken broth/water. Either way, coat the bottom of the pan with enough oil to cook. Dice and combine Bok Choy and green onions. Set aside. Place 8 wrappers on 2 plates. Evenly divide the vegetable filling among the won ton wrappers. Cover each dumpling with another wrapper. For each dumpling, gather the edges to form a round shape. Seal edges with water. Place each sealed dumpling (sealed side down) into a pan with oil. Fry and cover 4-5 minutes per side over low to medium heat. During panfrying, add chicken broth and cover. Turn over each dumpling. Fry each side until the won ton skin is crispy and partially golden brown. 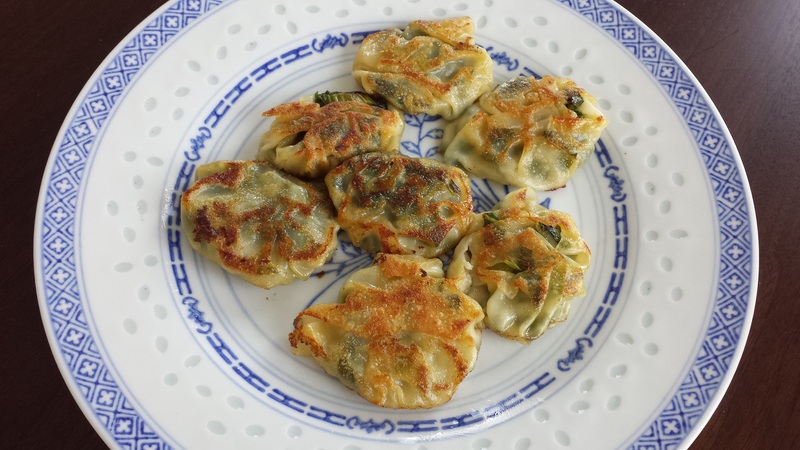 This entry was posted in Recipes and tagged Panfried Vegetable Dumplings. Bookmark the permalink.